Since switching over our domain to Google Apps Education Edition in March of this year, the transition has been very smooth. Gmail and Chat provide seamless day to day communication and while the only PD has focused on Gmail, Docs is taking off on its own accord as staff see the benefits and ease at which they can share documents for a more collaborative approach to school admin and planning. For example, the notion of one staff member being solely in charge of the duty roster is gone as the ownership of this is shared and staff can edit and negotiate independently. Can’t wait to see how the next step of rolling out school wide use of Calendars is received. However another bonus of the App package is having our very own Google Video site. At this stage the Education Edition allows for us to have 10GB of storage for videos. While that does not sound like heaps, the average size of our students’ podcasts or short movies is between 2-3MB once exported, so that’s about 3300 videos we can store, for free. Not only free, but in a completely secure, safe and add free environment. For our portfolios we have been using Teacher Tube to host and store our video content which has been proving reasonably successful. I have blogged about this before here. But TeacherTube has just completely revamped their site and now includes storage for photos, audio and documents. While this is a good improvement, the site revamp changed all the embed codes for the video content in my students’ portfolios. Grrrrrrrr. Should I just accept this as the changing nature of Web 2.0 environments? Grrrrrr. Regardless, after this happened, TeacherTube ceased to be my preferred option. The good news is that Google rolled out their Video hosting service to their Apps Education Edition. Videos can be shared with individuals, with groups, anyone within or out of your domain with just viewing rights or collaborative privileges, just like a Google doc. So does it work well? Sure does. Here’s an example thanks to my new entrant students from 9 years ago! So the question posed has been why? Why did we need to change our system over to Google? This goes well beyond email (Gmail), which is the only App we have currently implemented across the school, and I would like to think the move sets us up to participate more collaboratively and more effectively together. I guess the big picture view for me is of the changing nature of knowledge. Traditionally we often held on tightly to any knowledge we had, keeping it to ourselves and maybe sharing it with others on occasion. When we did share, others filed the photocopy away, or watched the movie but gave no feedback. The notion that knowledge belongs to someone is all a bit bizarre really and thankfully evidence and trends show that knowledge assumes a greater force when it is shared, discussed and built on. Wikipedia of course is the classic modern example. I am certainly not alone in thinking this and perhaps the best known explanation I know of can be found in this clip by Charles Leadbetter. an ongoing research project that seeks to identify and describe emerging technologies likely to have a large impact on teaching, learning, research, or creative expression within education around the globe. practical models as well as access to more detailed information. The report suggests collaborative environments have a time-to-adoption horizon of one year or less. If we also look at the 2008 and 2009 Horizon Reports including the 2008 Australia and NZ Edition Horizons Report, they also describe cloud computing, collaboration webs, collective intelligence which all describes the ability to create, share and collaborate online. So really the answers as to why we have changed is really me standing back and looking at the big picture of what not only the school administrative systems might look like in the next couple of years, but more importantly one of the ways the students will be actively learning. While I can see quite clearly how this will look and develop, I have the advantage of having used this environment for the past few years, Gmail since its conception in 2004. I must always keep this in the back of my mind when planning and strategically implementing the Apps with the staff. Already staff are seeing the potential benefits and I can’t wait for the momentum to keep building. We are about four weeks into our school wide move to Google apps and the move is still seemingly smooth. One minor complaint has been the lack of an alert sound when new mail arrives, as one would get when using a mail client such as Mail. A quick web search solved this problem and by installing Google Notifier, not only do you get a new email alert sound, but a small window opens to inform you who it is from and a gives you a preview of the message. It is actually very good if you are sitting and working at your computer, but if you are like me and most of your day is spent in the classroom with students it serves little purpose… However, it also allows you to set your default email client as Gmail which is a neat feature so that clicking on an email link opens a new web-based Gmail. The other issue I am trying to solve is around the scan to email function on our Konica Minolta copier. This was an oversight by me and it wasn’t until after our switch and people wanted to scan items that the problem arose. So I spent an hour trying to problem solve this today, religiously following the manual step by step with no luck. I will try the help desk tomorrow.Â A little frustrating as I though I had thought of every angle. While it is possible to scan to our server via FTP, scanning to email is the preferred option. Any ideas on how to get this working successfully would be great! Finally, last week we had one of our iTips PD sessions on Gmail. iTips are our main form of elearning professional development and are optional short burst of learning after school for about 45 minutes. About half the staff attended, some coming with an open mind, willing to be sold the Gmail concept. Most left happy, especially after we had imported their existing Address Book (using A to G) and when they understood the whole Google Gears offline access, filtering and labelling of emails and the chat/video chat functions. Some of the Labs projects also opened up a whole new world of possibilities. I will try and cover this more comprehensively in my next post. The past couple of weeks has brought about some major changes to way we are administering our email and calendering systems within our school. We have taken the step to switch our email over from being administered on our own server to the convenience and power of the mighty Google. The switch happened seamlessly, only requiring a phone call to Inspire to change our MX records to point to Google not to our school’s server. Everything else was completed online, and once Inspire flicked the switch over our Gmail was up and running within a couple of hours once the domain name change had propagated around the globe. After Google had authenticated us as an educational institute, which took about 10 days, we were upgraded to the Education Edition and now have add free services, more comprehensive admin features and the ability to create and manage 100’s of users, all for zero cost. It is very easy to administer the services and like any Google product, there are discussion forums on any conceivable problem you may encounter. The change has meant some new learning for staff as they have shifted from using Apple’s Mail, to the web based Gmail. Email addresses have remained the same. 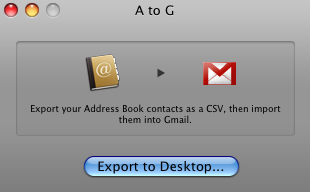 Those already using Gmail welcomed the transition but others, as with anything new, questioned the need to do it. Managing this change is always the key to making it work. So why did we change? Here are some of the key reasons. Google apps becomes a one stop shop for school admin. Our existing set-up was a mish mash of systems that meant going to a variety of places to view calendars, check email, shared contacts, chat, video conference, book facilities etc. Google apps gives us that under one log in. Anytime anywhere access. While previously available, the ease of the new system makes the old method seem very clunky. Collaboration! Collaboration! Collaboration! The Google Apps package is built around the notion of sharing, participation and working together. The one disappointment I have with the Google Apps package is that Google Reader is not part of the service. To access this, you needs to have a separate Google account. Having Reader as part of this service would really make it the hub for all your professional learning network needs. I would also love to see Google’s Custom Search function put in the package. The biggest challenge I can see is the dependence of staff on using Word or Pages to create documents and then emailing them as attachments to the recipients. While there will always be a need to do this, a huge amount of this documentation can more simple be shared with users. This is a huge change in thinking and approaching how information is shared and worked on among multiple users. Something to keep modeling throughout the school. Look no further than Google Apps for eportfolios? Helen Barrett in her latest blog entry has made a big claim regarding Google Apps, formative assessment and eportfolios. I am now convinced that in GoogleApps (Sites, Docs, etc.) I have found the best free Web 2.0 tool for maintaining an online personal learning environment that can be used for formative assessment in education. I have a lot of respect for Helen Barrett and have used and referenced her work and research many times. However on this occasion, I do not fully agree. Google Apps are fantastic. They continue to offer new apps and improve on existing ones all for free. I would be lost without my gmail, docs, calendar and reader. If you were to take a snapshot of my personal learning environment (PLE) and time spent in various web 2.0 tools, GoogleApps would far and away take up the largest slice of the pie. However, my experiences with Google Sites as a means for pulling together all the strands of an eportfolio for the students at our school, were not entirely successful. I base these thoughts on the set of criteria we developed in order to select the eportfolio tool that best fit what we required to support teaching and learning. Ability to demonstrate learning: The ePortfolio solution needs to be able to display (show within the portfolio not provide a link to file) all the possible media that the students will generate or want to share. This includes but is not limited to: podcasts and movies (m4v, m4a, mov), documents (pdf), images (jpg, png, gif) and embedding Web 2.0 content. In my experiences with Google Sites, this is not possible. Embedding Web 2.0 content just doesn’t seem to work, apart from Google related products. This has caused me many frustrating moments as the embed code is stripped for other content. Again, Google Sites is a great product but are we trying to fit an eportfolio in a package that doesn’t really work? Regarding the statement of GoogleApps and formative assessment, any tool that supports feedback, reflection and commenting can theoretically support formative practice. However, when one looks at Barrett’s process for developing eportfolios using Google Sites, what I believe is one of the most important aspects of a formative eportfolio, the student acting on feedback and their own assessments to improve their learning, only gets a passing comment at the very end. The portfolio developer should be given the option of updating the work, based on the feedback and the rubric. I see formative assessment as being cyclic in nature with the student action as I described above central to the process. After all, self-direction and self-regulation by the student are two very important outcomes. 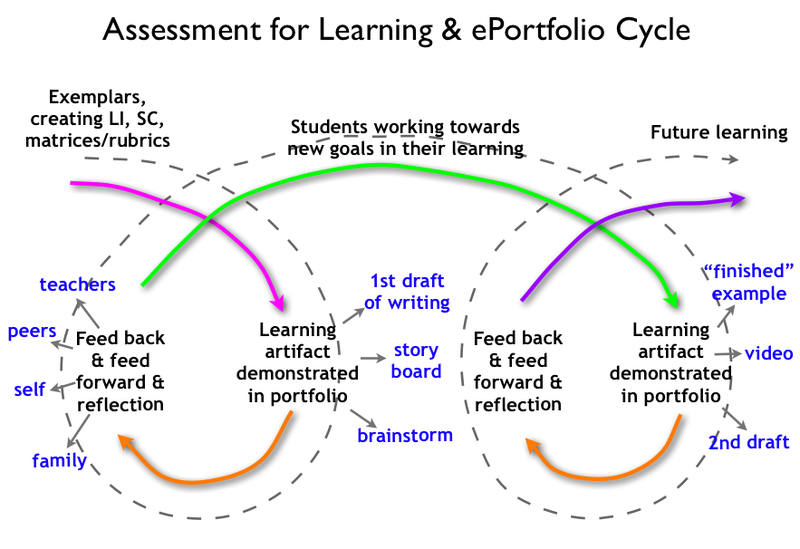 The following diagram (click for larger version) was developed to reinforce this point as part of the big picture of developing eportfolios for learning. So what do you think? Is the student action component as important as I believe? Are the GoogleApps really the best solution despite my reservations? Let me know!